January Boys & Girls Club Night with the Blades. Additional entertainment during this game provided by the “Fur Circus”. The Fur Circus is the most en-FUR-taining, FUR-loving and totally FUR-joyable group you will every lay your eyes on! It’s FUR-tastic! With this mixed bag of talent and the amount of laughter generated, you won’t want to miss the entertaining antics first hand! Please plan to come out and enjoy the fun while supporting the Clubs. Also, if you cannot make it to the game but would like to purchase tickets and donate them back to the kids at the Clubs, that is great! Shannon, the BGCLC CEO, will ensure they are fairly distributed. Feel free to call (239) 334-1886 if you have any questions. David Dombrowski, president of baseball operations for the Boston Red Sox, will serve as this year’s Evening with the Red Sox guest speaker, sharing his experience in the baseball industry and what fans can look forward to as he takes his new position with the team. Dombrowski has nearly 40 years of service in Major League Baseball. He most recently served as president, CEO and general manager of the Detroit Tigers. Dombrowski also spent 10 years as general manager for the Florida Marlins prior to joining the Tigers and served the Montreal Expos for parts of five years from 1986 to 1991 in a variety of front-office roles. He was recognized as the UPI Major League Executive of the Year, and Baseball America acknowledged the Expos as Organization of the Year in both 1988 and 1990. In 1998, the Marlins were honored by USA Today as Organization of the Year. 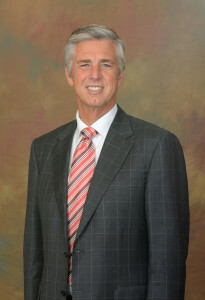 Dombrowski received his first baseball experience in 1978 with the Chicago White Sox, where he spent four seasons working in the minor league and scouting department, and in the player development department before being named assistant general manager in 1981. He eventually was named vice president of baseball operations for the club in December 1985. Throughout his career, Dombrowski has received numerous awards for his achievements in baseball. A native of Chicago, he attended Cornell University – where he played football – for one year, but later transferred to Western Michigan University where he earned a degree in business administration in 1979. His alma mater recognized him with its Distinguished Alumni Award in 1998. Benefiting the Boys & Girls Clubs of Lee County, the 11th Annual Evening with the Red Sox will be held on Wednesday, March 2 at the Crowne Plaza Hotel at Bell Tower Shops, located at 13051 Bell Tower Drive in Fort Myers. The evening will begin at 5:30 and include a cocktail reception with hors d’oeuvres, beer and wine, dinner, autograph signings from Red Sox players, and silent and live auctions that will include exciting trips to major cities, sports memorabilia packages, theme park passes, golf outings and more. Last year’s event included autograph signings by former Red Sox Manager John Farrell, former Red Sox player Derek Lowe and current players Brock Holt, Joe Kelly and Tommy Layne. Bill Banfield, the voice behind the Florida Gulf Coast University Eagles and co-host of FGCU Eagles Hotline Coaches Show on ESPN Radio 99.3, will serve as the event’s emcee. This year’s presenting sponsors are Allstate Insurance and Ted Todd Insurance. Sponsorships and tables of 10 are available from $1,600. Donations for auction items are also being accepted. Funds raised during the event provide more than 30,000 hours of service to more than 420 young people in our community who are a part of the BGCLC. Last year, more than 1,300 youth demonstrated academic success, character and leadership, and healthy lifestyles from the agency’s programs. Benefiting the Boys & Girls Clubs of Lee County, the 11th annual Evening with the Red Sox will be held on Wednesday, March 2 at Crowne Plaza Fort Myers located at 13051 Bell Tower Dr, Fort Myers, FL 33907. The evening will begin at 5:30 and include a cocktail reception with hors d’oeuvres, beer and wine, silent and live auctions, dinner and autograph signings from Red Sox players. The auction will offer a unique list of silent and live auction items this year including exciting trips to major cities, sports memorabilia packages, theme park passes, golf outings and more. Presenting sponsors for this year’s event are Allstate Insurance and Ted Todd Insurance. Jim Larkin, general manager of the Crowne Plaza Hotel, and Rodney Ford, distribution center manager for Coca-Cola Beverages Florida, are this year’s event co-chairs. Sponsorships and tables of 10 are available from $1,600. Donations for auction items are also being accepted. For more information or to become a sponsor, contact Shannon Lane at 239-334-1886 or slane@bgclc.net. Funds raised during the event provide more than 30,000 hours of service to more than 420 young people in our community who are a part of the Boys & Girls Clubs of Lee County. Last year, more than 1,300 youth demonstrated academic success, character and leadership and healthy lifestyles from the agency’s programs. Tiburon Golf Club and WCI Communities, The Colony Bay Club and Pelican Preserve, are embracing the joy of giving to others this holiday season. These three communities have partnered with Boys & Girls Clubs of Lee County for their Annual Giving Tree. Tags have been distributed requesting gifts for Club Members who are in need this holiday season. Gifts purchased will be distributed at the Annual Christmas for the Clubs on December 18. The Florida Everblades & Coca-Cola Beverages Florida have teamed up to present “Boys & Girls Clubs of Lee County Night with the Blades”! The Florida Everblades and Coke-Cola Beverages Florida have teamed up to present “Boys & Girls Clubs Night with the Blades”! All Coca-Cola employees, clients, and friends and anyone associated with the Boys & Girls Clubs of Lee County can purchase $20 End Zone tickets to “Night with the Blades” for $15, $25 Premium tickets for $20, or $31 Club seats for $25 and $5 of each ticket purchased will be donated to the Boys & Girls Clubs of Lee County. Just fill out the form below and fax back to 239-948-9299 or e-mail to chrisp@floridaeverblades.com. Tickets will be processed and left at Will Call under the buyer’s name. Deadline for ordering tickets is Friday, December 11th @ 12pm. Meet Former Masters World Champion Kristin Harvey! Calling all Ladies! On Thursday, December 3rd, Go Girl Cycling is hosting a female only kickoff party for the Everyone Rides multi-event fundraiser for the Boys & Girls Clubs of Lee County. The event will begin at 6:30pm and include lite fair, beverages, tire changing tutorials, and girl talk. There will also be a raffle for cycling-influenced items. This event is FREE to all ladies who attend and tickets can be found at GoGirlCyclingParty.Eventbrite.com. 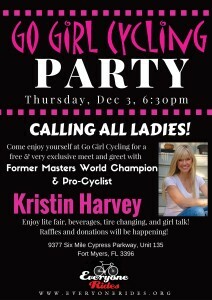 Go Girl Cycling in Fort Myers, FL will be the host for the Go Girl Cycling Party where you can mingle with former professional cyclist Kristin Harvey. Kristin has raced for 12 years, 8 of them as a pro-cyclist. She won Masters World Champion in the time trial and then retired in 2012. Kristin is currently Vice President of Client Services and Marketing for Momentum Sports Group, who owns and operates the UnitedHealthcare Pro Cycling Team and the Maxxis-Shimano Pro Cyclocross Team. Presented by Ted Todd Insurance, Everyone Rides is a multi-event fundraiser, which also includes Everyone Runs and Everyone Relax, to support the Boys & Girls Clubs of Lee County, which provides safe and supportive low-cost after-school and summer enrichment programs to our community’s at-risk youth. The 12th annual event will take place on Sunday, Dec. 6 at JetBlue Park located at 11500 Fenway South Drive in Fort Myers. Full-event information about Everyone Rides, including times, early-bird discounts and VIP pricing, is available at www.EveryoneRides.org . Boys & Girls Clubs of Lee County is pleased to partner with Gap Outlet of Miromar Outlets and Noack & Company in Fort Myers to kick off their Toy Drive! 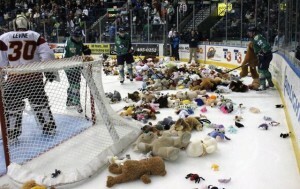 The toy drive will be held from November 23 through December 15. Kids’ ages range from 6-18 years old and new, unwrapped toys are welcome with balls and books being preferred. What: Toys should be new and unwrapped. We are encouraging participants to bring balls and books as that is what is most needed by members of the Clubs. The Crowne Plaza Hotel at Bell Tower Shops and Morgan Stanley of Fort Myers and Naples once again teamed up to sponsor the sixth annual Fall Feast for nearly 250 members of the Boys & Girls Clubs of Lee County, including all five area Clubs, and its staff and volunteers. 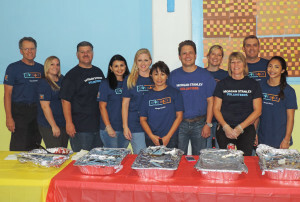 Morgan Stanley’s Fort Myers and Naples locations raised the funds to provide the transportation and food for the event, while the executive chef and cooking staff at the Crowne Plaza Hotel prepared and cooked the meal. The traditional feast included turkey, ham, stuffing, mashed potatoes, green beans, macaroni and cheese, homemade cranberry sauce and dessert. Mingle with Pro-cyclists and a Nascar Driver! 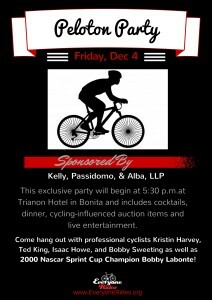 Join us on Friday, Dec. 4, at the Trianon Hotel in Bonita Springs for the exclusive VIP Peloton Party, sponsored by Kelly, Passidomo & Alba, LLP, to the kick off to this year’s Everyone Rides multi-event fundraiser. The evening will begin at 5:30 p.m. and include cocktails, dinner, cycling-influenced auction items and live entertainment. Tickets are $75 per person, and all proceeds of this event will go to support the programs of the Boys and Girls Clubs of Lee County. 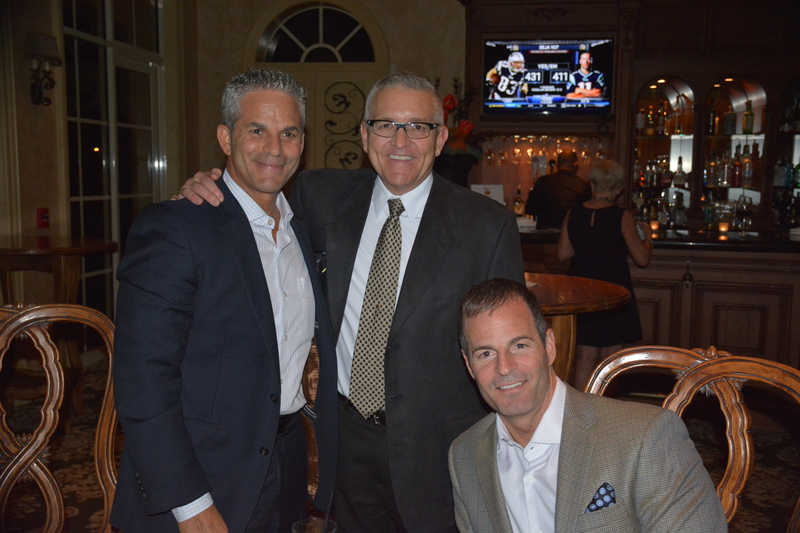 The Trianon Hotel in Bonita Springs will be the host for the VIP Peloton Party where you can mingle with professional cyclists Kristin Harvey, Ted King, Isaac Howe, and Bobby Sweeting as well as 2000 Nascar Sprint Cup Champion Bobby Labonte! The Boys & Girls Clubs of Lee County’s 2nd Annual Under the Harvest Moon drew about 200 people to The Club at Renaissance in Fort Myers, Oct. 29th and raised more than $55,000 from the event. 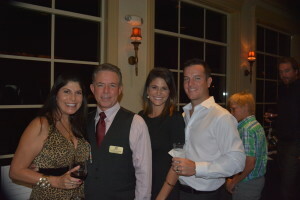 The autumn-inspired dining event was sponsored by Jaguar Fort Myers. The event featured culinary delights provided by The Club at Renaissance, cocktails, and silent and live auctions. The generous giving raised more than $55,000 for the Clubs. Other notable sponsors of the event were Charlie Todd from UBS, Mark Loren Jewelry, Norman Love Confections, Longhorn Steakhouse, Titos, and Wicked Dolphin. Funds raised support the programs of the Boys & Girls Clubs of Lee County, which provides safe and supportive low-cost afterschool and summer enrichment programs to the community’s at-risk youth.